Estimates of the scale of the event differ by order. Supporters of the leader of the Movement of New Forces, former Odesa governor and ex-president of Georgia, Mikheil Saakashvili, have rallied in central Kyiv for his release and the adoption of a law on impeachment. Police, media and Saakashili's allies gave differing estimates of the number of participants in the rally. Police said there were 2,500 protesters. According to an LB.ua correspondent, there were up to 5,000 whereas the organisers of the event put the number at 50,000. They have walked along Shevchenko Boulevard, Khreshchatyk Street towards Independence Square, where a stage has been installed for a rally. During the march, the protesters chanted "Freedom to Misha" and "Free Misha". They also chanted "Poroshenko should Resign," "Hands off NABU [National Anticorruption Bureau of Ukraine]," "March of millions," "Freedom to political prisoners," "Impeachment," "Ukraine, rise up" and others. No provocations and emergency situations were reported during the event. 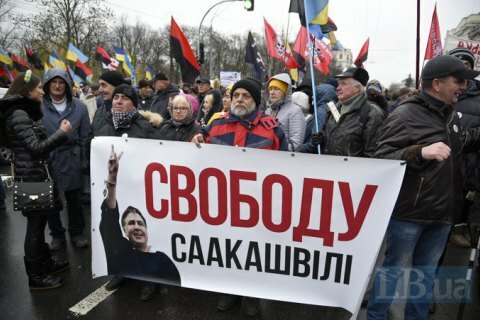 Saakashvili's wife, Sandra, also took part in the march, according to UNIAN. Saakashvili was detained late in a residential district in Kyiv on 8 December. On 5 December, law enforcers attempted to detain Saakashvili but he was released by the crowd. He is suspected of working with fugitive oligarch Serhiy Kurchenko, currently based in Moscow. The latter allegedly gave him 500,000 dollars on antigovernment protests. The international community must react to Russia's aggression against Ukraine at sea or risk a major escalation in the region.